If you do any business travel, you know how important -- and annoying -- it is to track your spending. These apps can help. Traveling these days is a hassle, no matter why you're going, or where -- and the necessity to track your expenses along the way just adds to the irritation. A good app, though, can make things a lot easier -- not only during the trip but afterwards, when you have to report it all to your (or your company's) accountant. The following seven Android apps have been created to help users track and report on their expenses. Some are strictly for business purposes; others can be used for both personal and work finance tracking. All of these have been updated within the last six months and have earned a rating of at least 4 out of 5 stars on Google Play by at least 100 users. All that being said, they encompass a fairly wide range of features. All offer the ability to manually enter an expense, to categorize it, and to either create a report or export the data so it can be used in a spreadsheet or other format. Some allow you to photograph your receipt so you have proof of payment; a couple, such as Abukai Expenses and Expensify, even extract information from those photographs. All of these have free versions, which are the ones I tested. For each, I entered a number of expenses manually; when available, I added photos of receipts. I exported those expenses as a spreadsheet or PDF, depending what was available, and then explored the app further to see what other features it offered. Some offer ad-free versions for an additional fee while others offer "Pro" versions with more advanced features; Abukai and Expensify both also have corporate versions with enterprise functionality. Note: I tested all but one on a Nexus 7 tablet loaded with Android 5.0 (Lollipop). The exception was Abukai Expenses, which kept crashing on the tablet; I tested that instead on a Moto X (first version) smartphone using Android 4.4.4. As with all apps, which one you choose depends on your individual needs, the needs of your company and what type of interface you're most comfortable with. Abukai depends solely on photographed receipts; it does let you add an additional note to each (left); each set of 10 receipts is counted as a submission; free accounts allow for 12 submissions a year (right). Abukai is a company that sells a number of business productivity products, one of which is Abukai Expenses. The app allows you to photograph your receipts, check the info, enter any additional data and upload it to create a report. Unlike some of the others here, Abukai is strictly for business expense reports. The assumption is that you're going to have paper receipts for all your expenses and that the app will provide a way for you to report those expenses without having to actually type in the information. It opens on a listing of your previous expense reports; two buttons at the bottom are labeled "Add Receipt" and "Process Expense Report." When you add a receipt, you are dropped immediately into a photo app; if you are dealing with a black and white receipt, you are encouraged to use a mode called "Copy Look" which converts the photo to a simple black-and-white format. Unfortunately, the app kept crashing when I tried to use it with the Nexus 7 tablet loaded with Android 5.0.2 (Lollipop); I switched to a Moto X (first version) using Android 4.4.4 (Ice Cream Sandwich), which worked most of the time. Once you've collected and photographed all your receipts, it's time to hit that second "Process Expense Report" button, which causes Abukai to email you a report of your expenses. It did so quite quickly and efficiently, as it turns out. About five minutes after I told it to go ahead, I received an email with several files attached: a PDF copy of three receipts I had photographed, and files in five different formats: XLS, XLSX, CSV, OFX and LIF. I took a look at the XLSX (Excel) report and was pretty impressed: In a nicely formatted spreadsheet, it got all three amounts correct, including a handwritten total on a restaurant receipt. Of the three expenses listed, it got only the name of the restaurant wrong (mistaking the name of the server for the name of the restaurant). Abukai comes with a variety of formats to fit corporate expense needs, and also offers individualized features for companies, such as designing specialized reports and forwarding them to the appropriate staffers. There are a few glitches that that companies will have to be aware of. Any expenses that do not have receipts -- such as tips, for example -- will have to be manually entered, as will any corrections. And individuals or companies considering Abukai should test it thoroughly first to make sure it works on all their employees' devices. But on the whole, organizations that want a strict accounting of its employees' expenses should consider Abukai. Upgrades: Free version includes 12 expense reports/year (each expense report is counted as a set of 10 receipts). Paid version for an individual: $99/year for unlimited reports. Standard corporate: $99/user/year plus a one-time $49 set-up fee. Customized corporate accounts available. AndroMoney's colorful entry screen lets you enter data into a variety of user-configurable fields (left); this monthly view of your expenses can also be changed to a daily, weekly or yearly view (right). AndroMoney was the first app that I looked at -- and it presented a high bar that some of the others struggled to meet. Although it's described as a general budgeting app, it could work very well for business people looking to track their expenses. If you do plan to use it as a business expense app, try not to be put off by the design, which is bright, bold and not anywhere near as sedate as most financial apps are. For example, although you start at a summary screen, when you click on "New" for an entry screen, you're confronted with fields decorated with colorful icons and a bright blue, gold, red and green calculator. 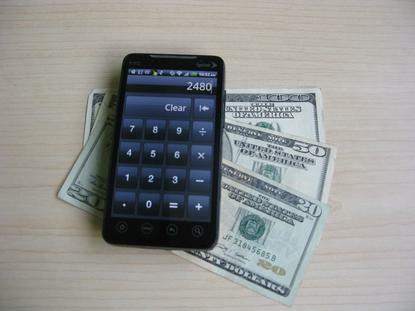 You use the calculator to enter your amount; you then can choose a category, account (credit card, cash, etc. ), specific project, payee and whether this is a one-time or periodic payment -- every second day, for example. (Although you can't do anything as complex as, say, twice a day for weekends, which would be handy for entering commuting expenses.) You can also add a freeform note. AndroMoney is extremely configurable. For example, each category has a series of subcategories, making it simple to, say, add an expense for Car > Tolls. Like the main entry screen, the layout is bright and easy to read; main categories are on the left and their subcategories listed on the right. And if you enter an expense and find that none of the existing categories or subcategories fit your need, you can add a new one immediately (rather than having to leave the entry and go to a separate screen). This ease of use extends to the other entry fields as well. When you're done, you can tap on either "Add Next" or just "Save." With the first, the previous settings are retained (except for the amount). Unfortunately, there is no running total on the entry screen -- to see that, you have to tap on Save, which brings you back to the main summary screen. AndroMoney uses reports as a visual way to see your finances rather than a way to send them to others; as a result, the Reports feature offers pie charts, trend charts and bar charts that can filter in a variety of ways. If you want a less graphic report, or something that you can send to your supervisor, you can export your data to a CSV file. There are a variety of other features, such as the ability to set a yearly, weekly or daily budget (and to send an alert if you exceed it). You can sync your account via an email account or back it up to either an internal SD card, Dropbox or Google Drive. You cannot photograph your receipts, which could be a problem for some. There is a paid version that costs $4.99, but the only difference between that and the free version is a lack of ads. AndroMoney was obviously built to be a general finance app for either personal or business expenses, but it is flexible enough to be used efficiently for either, especially if you're tracking expenses on an individual basis. It doesn't let you record images of receipts, and it has only very basic expense reporting features, but otherwise, it could work nicely for many users. Upgrades: Pro version ($4.99) is ad-free. 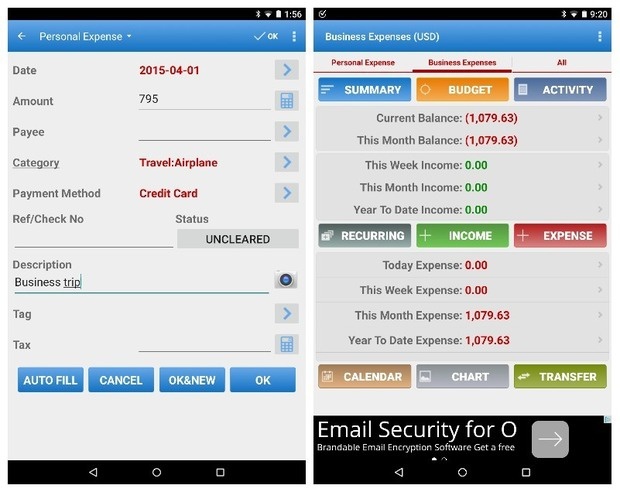 Expense Manager by Bishinews lets you enter a wide variety of categories, subcategories and other data (left); the rather crowded but informative main screen give access to recent expenses, the various app features and different accounts (right). Expense Manager from Bishinews is another personal expense app that can also be used -- and quite efficiently -- for business expenses. It opens on a comprehensive (and somewhat crowded) page that contains three rows of buttons that lead to a variety of functions, together with a listing of your balance, income and expenses for the week, month and year to date. A button labeled Expense leads to an entry page that offers a variety of fields, including date, amount, payee, category and payment method. You can also enter a reference or check number (and record that the check cleared), add a freeform description (with a photo of the receipt attached, if you wish) and/or a tag (to, say, separate out a specific project) -- and even calculate the tax. Like AndroMoney, Expense Manager offers a wide variety of pre-entered categories and subcategories -- for example, when I tapped on the Travel category, I was offered subcategories such as Airplane, Car Rental, Hotel, Food, etc. A plus sign on the category page lets you easily add a new main category. However, editing a category or adding a new subcategory is a little complicated: You have to first select Edit from the three-dot menu on the top of the screen and choose a category from there; you can then edit both that category and its subcategories. One nice feature is the ability to create more than one account -- for example, you could have one labeled "Personal Expenses" and one labeled "Business Expenses. " The different accounts then become easily accessible from tabs across the top of your main screen. Another is autofill -- you can create a list of pre-entered expenses and then choose the one you want to use when needed; you can even have an entry automatically filled when you select a specific payee or payer. When you're finished with your entry, you can either tap on a button labeled OK&New to save your entry and leave the screen up (together with most of the information), or just hit OK to go back to the main page. Expense Manager lets you create reports in Excel, PDF or HTML, organized by the week or the month. You can filter them by a number of aspects (such as category), email them or save them to another app such as Evernote -- in other words, you've got a nice range of report options. There are other features to explore in Expense Manager, including tools such as a basic calculator, currency converter, tip calculator (always handy) and a credit card payoff calculator. You can set up a PIN for security, back up your data as a CSV file, sync with Dropbox or save to Google Drive, set a daily reminder and tweak the look of the main page. Expense Manager by Bishinews is a flexible, feature-filled app that is suitable for both personal and business expenses. It has an excellent range of reporting abilities (although its spreadsheet reports aren't quite as polished as those provided by Abukai). There is a Pro edition for $4.99 that is ad-free; according to the company, that is the only difference between the two. 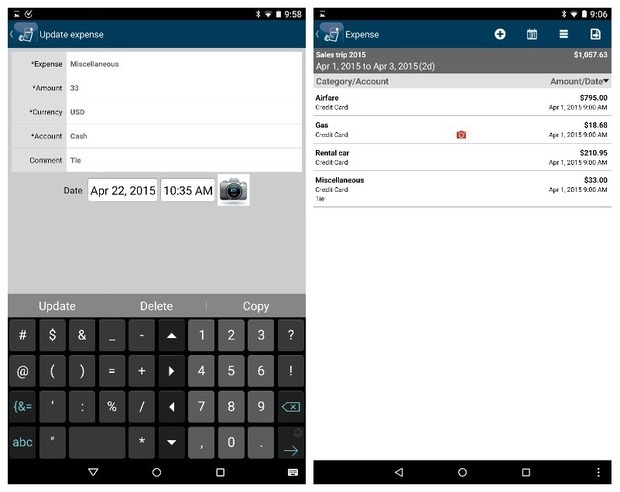 Expense Manager offers a very simple entry method (left); its History screen lets you see past expenses, with the categories color-coded (right). 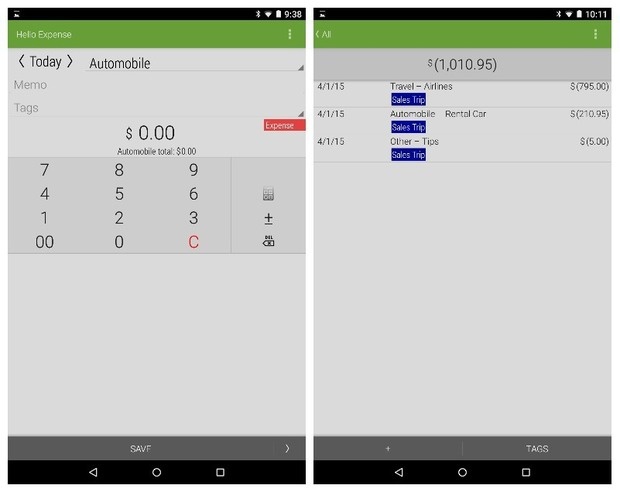 Expense Manager by Markus Hintersteiner is a fairly simple budget app that offers some good features, but doesn't have the range of apps like AndroMoney or Expense Manager by Bishinews. It opens on an Overview screen that offers a line chart illustrating your weekly, monthly or yearly expenses; you can set it up for one of the three. A plus icon on the top of the screen lets you record an entry. The entry screen starts with a pop-up number keypad; once you've recorded the amount, the pop-up disappears and you can then choose a category for your entry, change the date (the default is "Today") and type in a freeform note. Each time you save the expense, the app goes back to the Overview page, and you have to hit the plus sign again to enter the next one. Expense Manager doesn't offer as many options for categorization as some of the other apps reviewed here. You can add more categories if you want, but because there are no subcategories or tags, you have two choices -- either use the Notes field (to, say, differentiate plane fare from gasoline expenses under Transportation) or to create a large number of categories (for example, make Plane Fare and Gas their own categories), which could get unwieldy. Expense Manager lets you export an Excel report from the setup manager; any other reports -- such as statistics and income distribution -- are unlocked with a one-time $2.59 payment. Besides the Overview screen, there is a nicely formatted History screen that lets you see all your past expenses (also by the week, month or year). You can filter the screen by category. In the Settings screen, there are a number of other tweaks you can make: You can choose a currency, opt for a daily reminder to enter your expenses, back up your data to a wide range of services (such as Evernote, Dropbox, OneDrive, or Gmail, among others) and set a lock pattern for extra security. You can also create overhead expenses so you set a limit on how much you have to spend. Expense Manager is simple to use and could be a good app for personal budgeting; however, it's a bit too limited to be used for any but the most basic expense reporting. 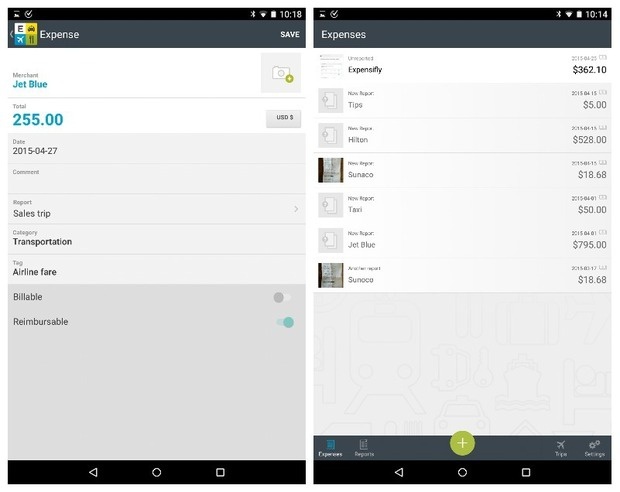 Expensify is a cloud-based app that lets you add your receipts either via photos or manually, as in this screen (left); the summary screen includes any photographed images you included (right). Expensify is a cloud-based expense tracker and reporters that offers both personal and business versions with a variety of feature sets. The Free version (the one I reviewed) offers 10 SmartScans (scans of receipts) per month, the ability to import expenses from your bank and credit card accounts, expense reports, receipt uploads and the ability to categorize and tag entries. A $5/mo./user "Team" version adds unlimited SmartScans and invoicing features; a $9/mo./user "Corporate" version adds more functionality, such as custom reports. There is also a custom Enterprise version. Expensify is a cloud-based application, so you have to sign up to use it. According to the site, the company uses "bank level security" to protect user data, including HTTPS+TLS data and password encryption. The opening screen shows you a list of already-entered expenses (assuming there are any, of course). At the bottom of the screen, a large plus sign lets you add a new entry; tap on it and you get four choices: Distance (which lets you track how many miles you've traveled, either using GPS, your odometer or manually); Time (which lets you set an hourly rate); Expense or SmartScan. 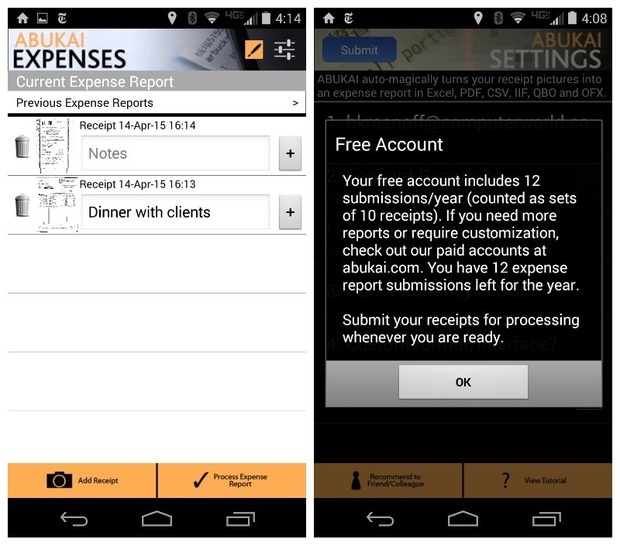 Expense is the screen where you can manually add your expenses. It has fields for a merchant's name, the expense amount, the date, a comment, a category and a tag. You can also add a photo of the receipt and log the expense as billable and/or reimbursable. Perhaps because Expensify is more a cloud application than simply a mobile app, there are a number of things you can do through its website that you can't do via the mobile app. For example, unlike most of the other apps reviewed here, you can't add a new tag or category on the fly -- or at all -- using the mobile app. In fact, the only place you can add a category or tag is via the website, which is less than convenient if you're on the go. SmartScan lets you photograph a receipt or choose one from your photo gallery; Expensify then uploads the photo to its servers, extracts the necessary information and downloads it to your account as an expense entry. It's a nice idea; however, when I tried it using a gas receipt at 3:30 pm on a Friday afternoon, it hadn't returned the data three hours later. When I signed back on the next Monday, the data had been uploaded; it included the merchant name, total price and the date. While this might be useful for employees who have long lists of receipts to enter, the lag could be an issue for some. But wait, there's more! At the bottom of each screen, along with the Plus icon, there are four other choices: Expenses, Reports, Trips and Settings. Expenses leads you back to your list of current expense entries. Settings offers a few tweaks to the app, such as the type of currency being used, whether you have access too offline mode and whether you want to upgrade. Trips is an interesting-sounding feature: You can, according to the instructions, email a hotel, flight, rental car or train reservation to receipts@expensify.com and you'll get back an itinerary overview, flight status alerts and "automatic expense reports." Because I didn't have any current reservations pending, I wasn't able to test this particular feature. There are a couple of ways to create a report. You can go to Reports, create a new report and then choose which you want to include from your current list of expenses. Or you can create a new report and then, as you enter each expense, identify which report it should be included on. Once you've finished adding expenses, you can email the report to yourself (or to anyone else); the report arrives as an attached PDF file (which can be previewed before you send it) that includes any scanned receipts you may have added. Expensify is a professional expensing app that has a great deal of potential, especially for companies whose employees have to account for a lot of expenses. The amount of time it took for the SmartScan function to work gives one pause, but if that can be smoothed out, this is certainly an application worth investigating. Upgrades: Team version ($5/mo./user) adds unlimited SmartScans, invoicing; Corporate version ($9/mo./users) adds custom reports, other features. Enterprise version available. Hello Expense has a very simple interface which allows you to add new expenses quickly (left); you can use color-coded tags to organize your expenses (right). When you open the app, you're dropped immediately into an entry screen for the day's date. You can change the date, choose a category from a drop-down menu, write in a freeform memo and select a color-colded tag. Right below the area with the fill-in field, there is a large calculator for entering the expense amount. Hello Expense is a bit different than the others here in that you don't have to hit the period for your cents; you just type in the amount. If you're putting in a whole-dollar amount, you can simply hit the "00" button on the calculator to add zero cents. When you're done, tap the Save button at the bottom. In order to set up, edit, delete or add categories, you have to do it from the Setup screen (which is accessible from the three-dot menu on the upper right corner of the display). You can, however, add a new tag directly from the entry screen, and can assign as many tags to each entry as you wish. Your expenses are listed under the calculator as you're doing them; once you do any kind of search or leave that screen, they are no longer visible underneath. You can tap any entry to edit it; you can then save the edited expense either as a changed entry or as a new entry (allowing you to, for example, enter a series of similar expenses). To see all your entries, you tap the arrow to the right of the bottom Save button. A pop-up menu then invites you to do a search, see all your entries or filter by category, day, week, month or year. You can also filter by tag, but only once you've chosen your initial search -- so, for example, you can choose to see all your entries, and then, once you've got the list, filter it by choosing your Sales Trip tag. Hello Expense has no formal report function, but you can export your expenses in either CSV or QIF format to other apps on your device (say, Evernote or Gmail); you can also save them to your SD card. You can choose which date, categories or tags to export. The resulting file is just a very simple rundown of the data (including a separate column for the currency indicator). There are a few other features that you can access if you click the menu icon on the top right. These include the ability to do a bulk update (for example, change the date for a set of specifically tagged entries) or tweak some of the formatting (such as the date format). You can also back up and restore your data. Hello Expense has been tweaked considerably since we first covered it back in 2012. It would be nice for business use if there were a way to add receipt photos; however, it remains a relatively simple but useful app for individuals who want to track their personal and/or business expenses. 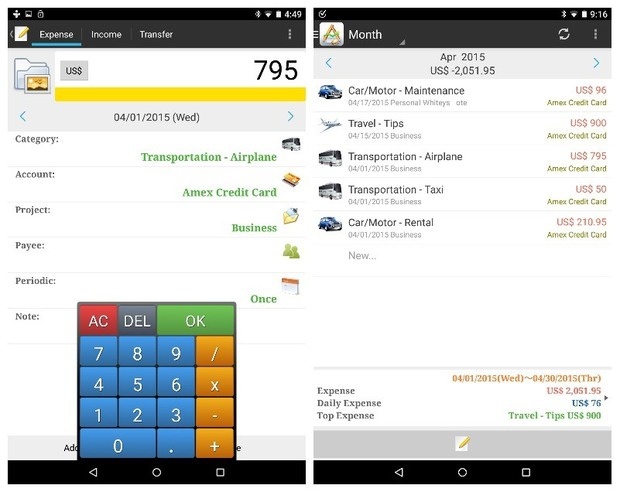 Travel Expense lets you add your expenses quickly and easily, together with a photo of the receipt (left); expenses are organized based on your specific trip (right). Travel Expense is, as its name indicates, focused on helping people track their travel expenses. It opens on a simple screen with six buttons that let you access all the major functions: Travel, Charts, Setting, Data, About and Exit. To start entering your expense you tap on the Travel button. There, you get a list of trips you have already entered. You can add a new trip or edit an existing one. Tap on the trip and you see a similar list of all the entries you have made for that one (assuming there are any, of course). Now you can either edit an existing entry for that trip, or add a new one, by tapping the plus sign at the top of the screen. Each expense entry has fields for amount, category, currency and account (cash/check or credit card); the second two are pre-entered but can be changed. You can also add a photo of your receipt, if you wish. Conveniently, expense categories can be added on the fly. Once you're done, you can either save the entry and go back to the listing of entries for that trip, or save and immediately add a new entry (however, all the information from the previous entry, including the amount, remains, which can be a little confusing). The screen for each trip also lets you filter by date or category. The Charts button offers access to a simple pie chart that shows the expenses for whichever trip you choose. The Data button lets you back your info up to your SD card, Dropbox or Google Drive; you can also email the database, which is in the .DB format. The fly in this particular ointment, however, is the expense report feature. Travel Expense is a free app but charges $4.99 per report to export and email an expense report in HTML, CSV or Excel. Upgrades: $4.99 per expense report. 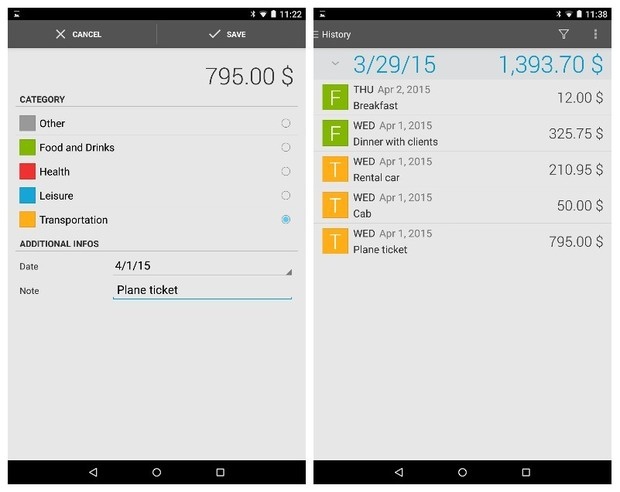 Travel Expense is a well-organized and simple-to-use app for tracking expenses during a business trip. However, because it demands $4.99 a hit each time you need to create a report, anyone who travels more than once a month may found the mounting costs a bit excessive. Having a good expense app can make things a lot easier for you, especially if you're traveling and need to keep track of all those cab rides and quick fast-food stops along the way. The apps here offer a range of abilities, from simple and quick record keeping all the way to customized corporate expense reports. If all you need are the basics, Hello Expense remains a simple, solid way to track expenses through your day. Expense Manager (Markus Hintersteiner's version) is also easy to use, but its limitations on categorization could be an issue for business users. Travel Expense would be great for tracking expenses on the go were it not for its rather pricey strategy of charging per report. If you're looking for something you can mold to your individual needs, AndroMoney and Expense Manager (Bushinews) are both excellent and flexible apps with a good number of options. I'd try either or both to see which suits your needs best. For more heavy-duty corporate use, both Abukai and Expensify offer much more technologically sophisticated solutions for individuals along with options for corporate versions. Neither is perfect: Expensify's SmartScan functionality is slow and doesn't pick up a great deal of information; Abukai's ability to scan receipts and drop them into well-formatted expense reports is impressive but the app was unable to work on one of my devices and occasionally crashed on the other. Either, however, is worth investigating if your researching third-party expense reporting services for corporate use.